MailChimp is a renowned email marketing automation platform, but it too has some flaws which bring’s it down. It’s not at all cheap and provides no discounts or offers on bulk emailing. Free plan has got very basic features, important features are locked. So, for effective emailing, you have to opt for paid versions. If you encounter any problem on weekend or at nights, no customer support will be there to help you out. Beisdes, MailChimp doesn’t facilitate Spam control. So, if you are looking for a cheaper & better alternative. Then this blog will assist you to find the cheaper as well as enhanced email marketing solution which is best for your business. 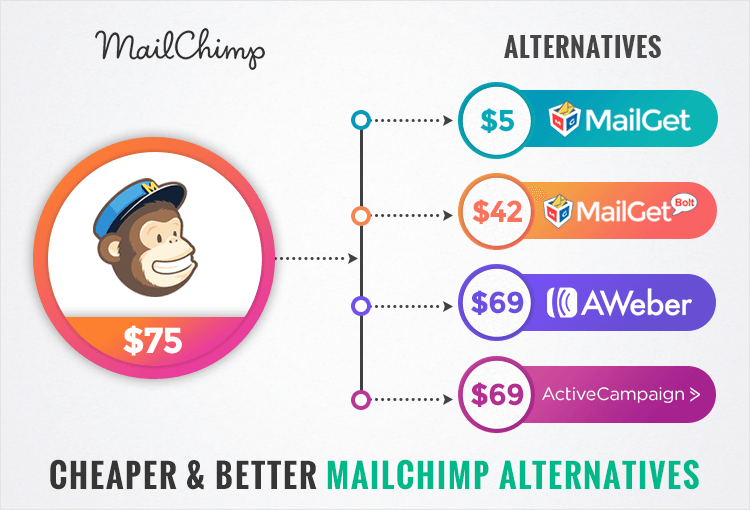 Quickly, go through the comparison of MailChimp Alternatives! Let’s start exploring the details. 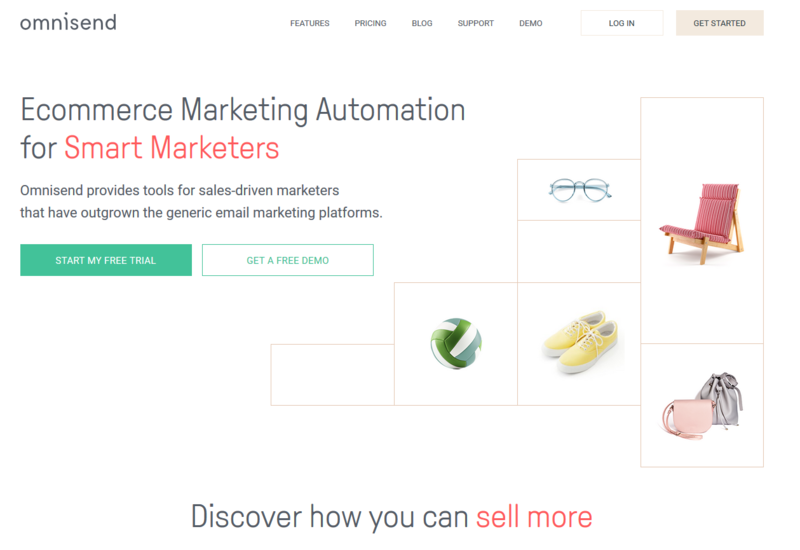 MailGet Bolt is veritably one of the best alternate for MailChimp. This email marketing service is easy-to-use, affordable, gives top-class customer support. And it is studded with lots of features like email list cleaning, email tracking, follow up tool and much more. Plus, it doesn’t require any type of hosting, SMTP configuration or set-up SMTP as per y. Price plans are cheaper, we targeted 10,000 contacts just by paying $42 for the base plan. MailChimp charged $75 for the same. In MailGet Bolt even the free plan allowed accessing all features. But here in MailChimp most of the advanced features are paid. Just sign-up to send 9,000 emails to 300 subscribers. With 30-days free trial, you can deliver 9,000 emails free of charge. The Starters plan permits unlimited email delivery to 10,000 contacts in a month for $9 per month. You can target the users & send bulk emails up to 2,500 with ease. For the Rookie plan, you gotta pay $19 every month & get access to send emails to 5000 subscribers. Next comes Pro plan in which you can send emails up to 10,000 users by paying $34 each month. MailGet Bolt provides an Advanced plan according to which you can send emails to 15,000 subscribers at the price of $49/mo. Drag & Drop Mail Builder:- Create emails that are 100% responsive using email editor. Without using a single line of code, just drag & drop fields required and design your own emails to increase customer engagements. Pre-Designed Templates:- Email creation is a time-consuming process to avoid it MailGet Bolt gives you free access to over 500 email templates which are attractive in design. Auto Drip Emailing:- Conduct drip email campaigns to reach customers at times when they are most available to engage, just schedule and rest will be done automatically. Customer Support:- Awesome customer support is provided, even on weekends prompt replies to queries are delivered by the support team. Similar features & services are offered at a very low price. Even the base plan has all the latest features & facilities. Initial restriction of 2,000 email delivery is there. The major benefit of using MailGet over MailChimp is that it allows multiple SMTP integrations simultaneously in it and supports most of the popular SMTP services. It also ensures inbox delivery, higher open rates, good deliverability and much more in which MailChimp lacks. This is also the cheapest email marketing service in the entire list which delivers futuristic feature with every plan. If you want a good open rate and deliverability on different email campaigns, I will say try MailGet as it helped us generate an Open Rate of around 43%. This is a service which will allow you to switch SMTP services and help you get good deliverability with fewer efforts at just $5. 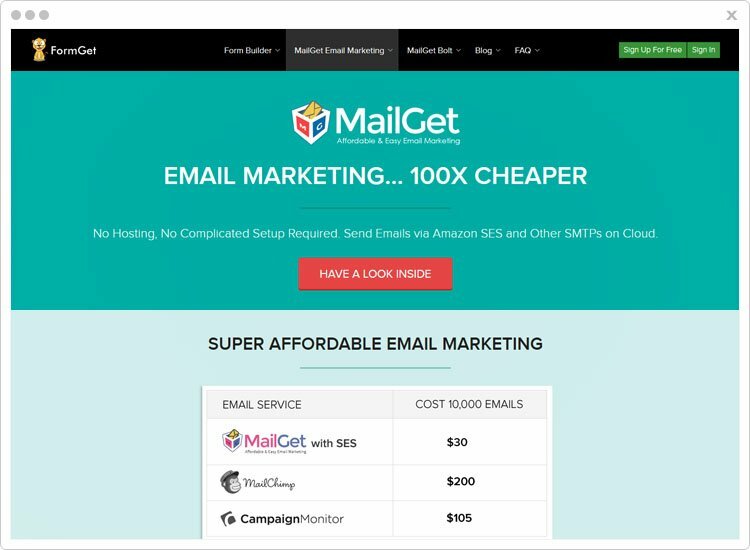 MailGet is one of the cheapest email service provider on the list, the base plan is priced only $5 a month for unlimited email delivery to 5,000 users. This plan will charge $29 on monthly basis for unlimited email delivery to 30,000 contacts. Other the pricing plans mentioned above, you can choose from 11 more packs for mass emailing. The price may vary as the number of subscribers increase. 99% Inbox Delivery:- With this emailing service it is easy to achieve higher inbox delivery. This will enhance user engagements and increase open rates as the emails will land in the inbox. SMTP Routing:- An advanced facility using which you can send emails via multiple SMTP servers, plus it guarantees email delivery as well. Multiple SMTP Integration:- You can easily integrate multiple SMTP services as all the well know services are supported. Email Preview:- Email inbox preview will help you prevent spamming & unsubscription as you can preview the emails before delivering them in bulk. Simply SMTP set-up and user-friendly dash. Without an SMTP service, email delivery is not possible. 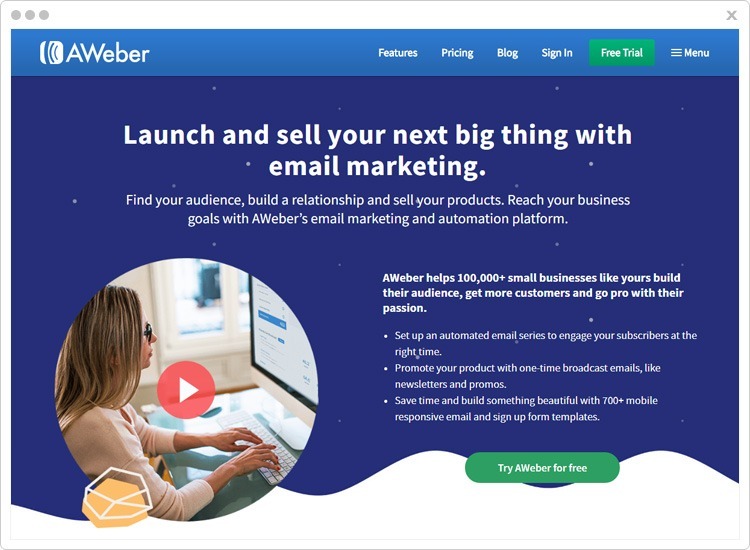 AWeber is another flawless emailing platform which can help you replace MailChimp. Email automation, contact segmentation, sign-up forms, API’s for emails, unlimited customer support via phone, live chat & email and more are the facilities that are there in AWeber. All the list facilities will bring a rise in open rates, increase customer interaction, the end result of which will be higher ROI. Free trial allows you to use all features available in a paid versions for 30 days. First paid version costs $19 a month for unlimited email delivery to 500 subscribers. $49 is the monthly price of this paid version with which you can deliver limitless emails to 5,000 contacts. For bulk email marketing there are 3 more plans and one custom plan for which you can contact sales team. Email Tagging:- This feature will help you target subscribers and trigger emails to users based on the opened emails and the links they click. Mail Tracking:- Get each & every detail on user actions performed on your emails like open, clicks, bounce, unsubscribe and more on different campaigns. Free Email Templates & Images:- AWeber offers 700 ready-made emails templates which are fully responsive in design and you can use them for free. Subscriber Management:- This email marketing platform simplifies the process of contact management as you can create segments, collect, view, segment and manage contact info. Get over 600 professional images for FREE. Android & iOS apps are also available. Some of the email templates are outdated. Mail automation facility is very basic. You can’t send emails to multiple segments at once. 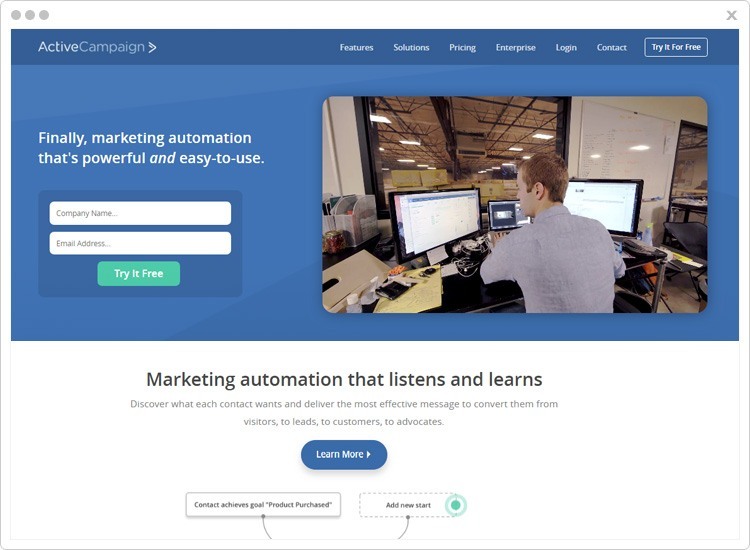 ActiveCampaign is a powerful & easy-to-use system which simplifies the process of marketing automation. This email marketing system is capable of fetching contact details which will help you do effective messaging in order to convert visitors, to leads, to customers and earn more profits. ActiveCampaign is a MailChimp alternative which can handle all your email marketing needs intelligently. Commence by sending 100 emails to 100 contacts through the free trial. The free trial provided by Active Campaign lasts for 14-days. Lite package includes services like unlimited email delivery to 1,000 contacts at the cost of $29 a month. $70 is the price of Plus package in which you can delivery limitless emails to 1,000 contacts using additional features & facilities. There are 2 more packages designed by Active Campaign which are Professional package & Enterprise package. As the number of users rise the price of the packages will also increase. Contact Segmentation:- You can apply basic as well as advanced logic to segment contacts on the basis of user-interactions, locations, behavior and more. Split Testing:- It will help you achieve highest open rates, clicks, and higher ROI as different types of content, subject lines, and emails formats can easily be tried. GEO Tracking:- Simple email tracking of opens, bounce, clicks etc are provided by most ESP’s, but Active Campaign is capable of live geo-location track with which locations of contacts can also be tracked. Spam Prevention:- You can do a real-time analysis to prevent spamming. This feature constantly checks user and judges them on various factors to avoid junk box delivery. Customer support is quick & responsive. Provides training, webinars & tutorials for the knowledge base. Some of the functions are complex. You get the free trial for a limited time period. Email builder lacks in some advanced features. When you‘re ready to improve your omni channel communication, Omnisend should be your first option. SMS automation, Facebook custom audiences, and Google remarketing lists are some of the most important features for advanced e-commerce marketing automation. With Omnisend, you‘ll get started with a free 14-day trial. This means you‘ll get full access to all the features and integrations. On the Standard plan, you‘ll be able to use the powerful automation workflows, Facebook custom audiences, and Google remarketing lists from only $10 a month. The Pro plan will give you all the essential functionalities: SMS automation, a dedicated account manager, and custom IP address. It starts from $199 a month, allowing you to send unlimited emails. SMS automation: Easily add SMS in your automation workflows. 24/7 support: no matter the time or day, our support staff is ready to answer your questions. Our average waiting time is only 5 minutes. Tailored for E-commerce: Pre-defined automation workflows, automated segmentation, and full campaign and automation reports to improve your sales. Missing iOS or Android application. Cannot copy created automation workflows. You can also replace MailChimp with ConstantContact mailing service, as most of the features which MailChimp offers are available in it. When compared to pricing it as low-cost plans with similar services & facilities. 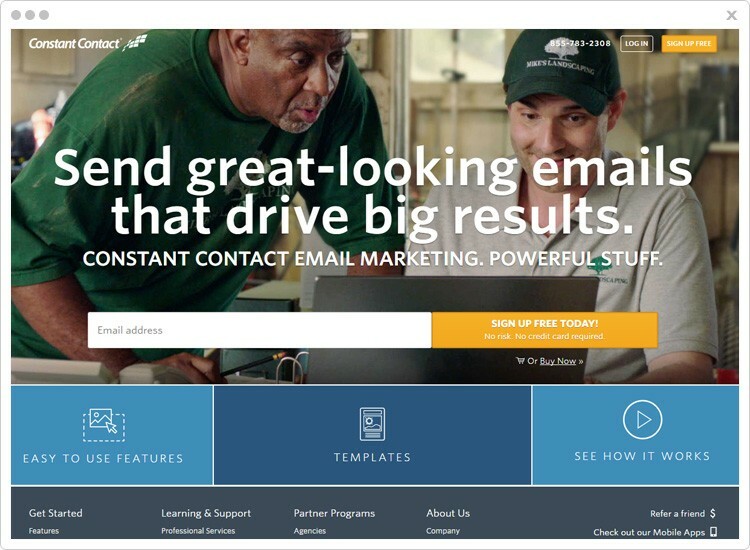 Testing trial by ConstantContact will last for 60-days free and will allow you full access to all email marketing tools available in the service. First is the Email Package which charges $20 for unlimited email delivery to 500 users, $45 for limitless sending to 2,500 users and so on. The next is Email Plus Package which equips the advanced features. The plans offered are like $45 a month for unlimited email delivery to 500 users, $70 for email delivery to 2,500 contacts and so on it goes. Email Builder:- The drag & drop email builder makes it easy to design emails and customize templates. Contact Managment:- Upload contacts from Gmail, Outlook, Excel, and other third-party sources. And takes care of the other contact details effortlessly. Real-Time Tracking:- Email tracking tool notifies you details like opens, clicks, unsubscribers and more & all these are updated in real-time. Easy Access App:- Create, send and monitor emails straight from your mobile. The free mobile app allows you to perform various emailing activities on the go using the App. Provides free email templates which are responsive. Easy contact imports from different sources. The application is secured & follows Anti-Spam policies. This is an overpriced service, as it charges more and offers limited services. Subscription canceling is difficult as you can’t cancel online or via email. This service does not support Autoresponder. After going through this article, I am pretty certain that till now you must have found a good alternative for MailChimp email marketing platform. Moreover, this blog highlights all the detailed information about the email services. Plus, it also emphasizes low priced services which provide similar features as of MailChimp. So, let’s end this blog on a positive note. Also, you can get in touch with us for more details & queries. Don’t forget to share your views in the comments section below. I have been using AWeber for over a year, there were some spamming issues in it. After going through your blog I and my team tested the trial versions. We now have Amazon SES service attached to MailGat email marketing tool and it is performing very well. I tried the free trial of MailGet Bolt. It is surely a good replacement for MailChimp. But, I am looking for a service which has the ability to clean my huge email marketing list. 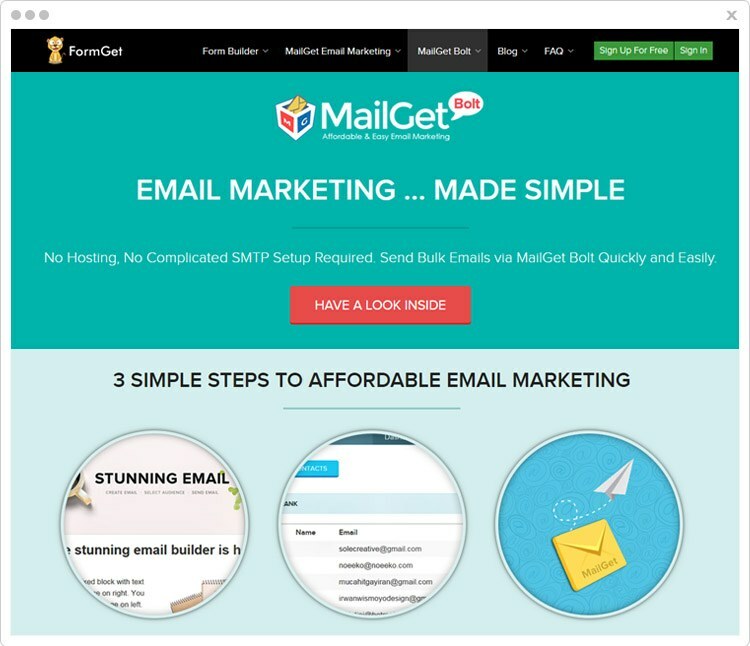 If you are opting for MailGet Bolt to do email marketing & online promotions. In that case, you should know that It has also got a List Cleaning facility which charges as low as $4 and removes all types of bad, incorrect and inactive emails from the contact list automatically.